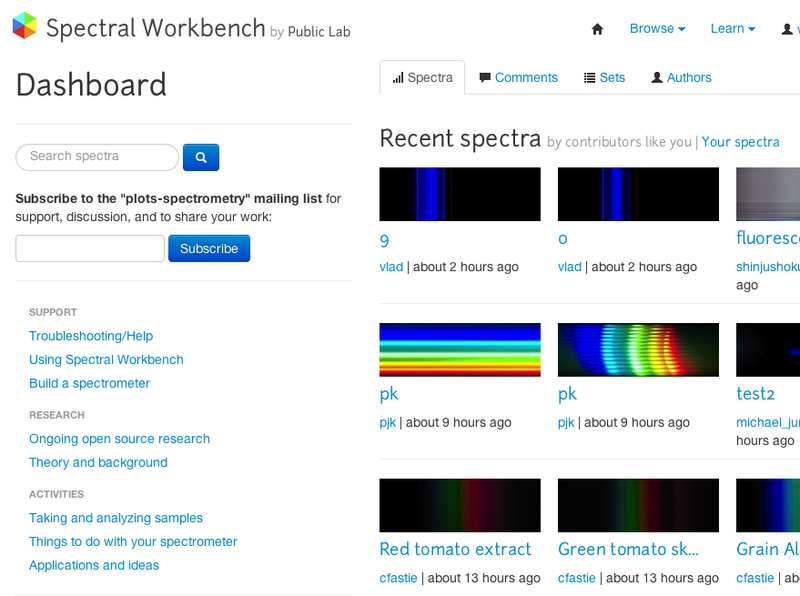 Changes to SpectralWorkbench have been varied; a really obvious one is on the front page (which you must be logged out to see), pictured above -- we are now showing 4 "featured" tags for different interesting things to scan, to encourage people to try things beyond the basics, and give folks an idea of what things should look like. A "flare spectroscopy activity" simulating gas refinery flare monitoring, but doable in a classroom, using a candle and a spray bottle of salt water. A new stats page shows some exciting stats about contributions: 1600+ contributors and over 10k spectra! Lots of other small improvements abound but these are some of the more exciting & fun ones. 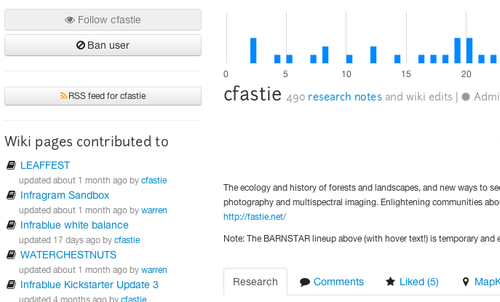 Thanks to Bryan and Dogi, and to all of you for sticking with us as these sites progress! 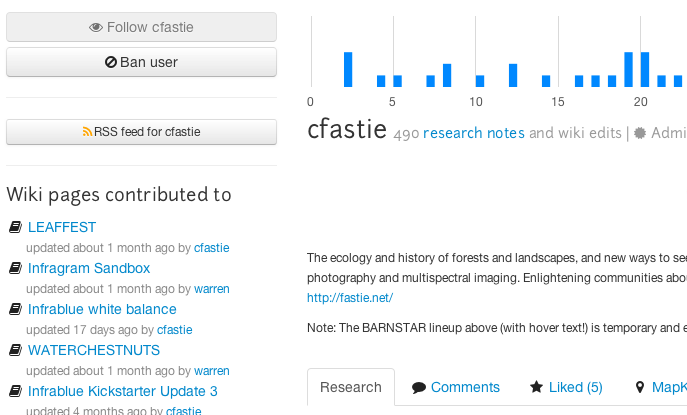 Special thanks to those who've documented bugs on Github, as well. hi, i wanna ask you about how to get the spectrum value, but not in RGB. can you help me? There should be an averaged # in the JSON, CSV, and XML downloads, but since the camera records it in RGB, perhaps the best way is to just add R+B+G? But that average is from RGB right? I want to know about value of the intensity from the spectrum. How you get that intensity? I think that's not from value of average or RGB. Cameras only record intensity for R,G, and B channels, separately -- the Bayer filter prevents raw, full-bandwith intensity reading. :-/ Sorry! Sorry, i want to ask you again. In the spectrum there is % y-axis, what does it mean? can i get the value of % y-axis with different wavelength? Ideally, we would measure all wavelengths equally in each pixel -- the diffraction grating should be separating out the colors (wavelengths) and each pixel records a different one, from 0-100% of the sensor's ability to detect light. (not an absolute measurement). However, since the camera has R, G, and B filters on each pixel, we instead get three images, each of which is filtering for a region of the spectrum. We could try to use data only from the "best" band -- like, measure green light generally with the green sensors, and red with the red. But what about light that's partway between green and red? (yellow) Where do we decide where to switch sensors? It probably varies per camera, too. So at this point, for consistency, we just add all three channels together. This is not as good as a monochrome (full spectrum) sensor, but those just aren't available at the low price and high resolution of webcams. Oh Iunderstand now, thank you. As I know, the range of RGB is 0-255 but in spectrum I see that max value of red is 257, why? And how about the correlation between wavelength and RGB? How you get the value of wavelength? ah... i think there may be a slight bug in the digitization of the image. Perhaps it was multiple rounding errors? Apologies... i could look it up in the code if that's helpful? The wavelength value is the x-position of the pixel, since the light has been split by wavelength.